By far NOT the best looking sheep in our flock. She's a bit puny and has spots everywhere. Her face is always a little crooked, and even for a hair sheep she has a weird half woolly, scruffy looking coat. Even her voice is goofy. She has a bleat that sounds like an old man with emphysema trying to clear his throat. But Pepper is by far the most outgoing, people friendly sheep we have on the farm. She will come running from across the field in hopes of a mouthful of corn or sweetfeed while all the other sheep look at her like she has lost her marbles. Pepper and Nina, our second most food hoggiest sheep. 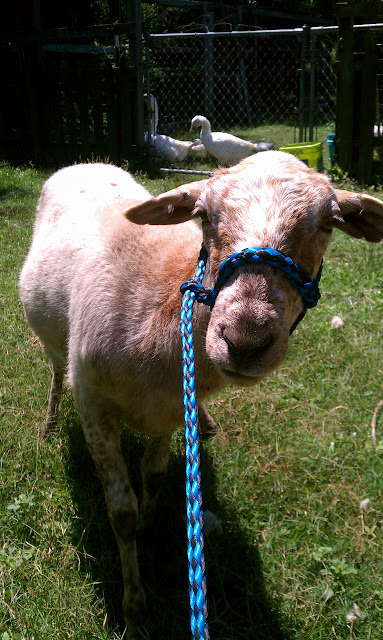 Since she is such a food motivated sheep, I decided to try halter training her. She just happened to follow me into the poultry house and after an extended and rather frustrating game of ring around the rack brooder, I got a hold on her and slipped on the halter. We went out into the goat yard (only smallish enclosed area we have out back), and I just waited while the girl threw a small fit about being attached to a human by the face (can you blame her, really?). 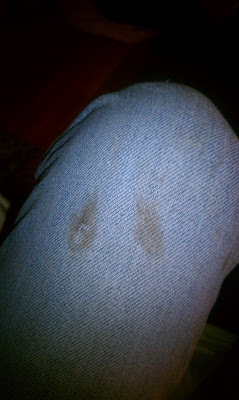 For my patience, I came away with a lovely hoof shaped stain on my pant leg. I wish I had gotten a picture of the look on the goat's faces' when I came in their yard with a spazzing sheep on a rope. 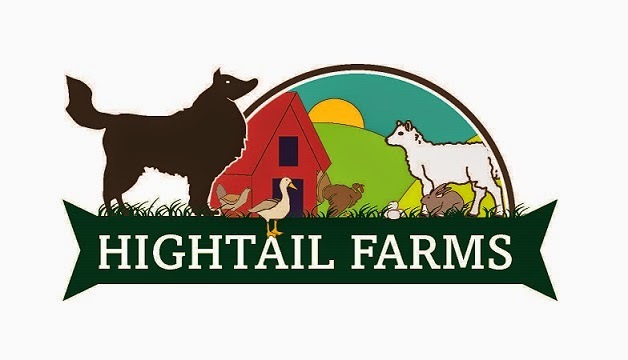 Who knew goats could raise their hackles like that. The whole time I was working with Pepper, I had to keep a close eye on Josie, our larger goat, because she was hell bent on finding an opening and letting that sheep know who ruled the roost. After Pepper was done bouncing around and tossing her head, she noticed the bowl of sweet feed in my hand and settled right down. Within a couple minutes, I swear that sheep was heeling better than most dogs I know. A couple days later I was able to get the halter on her again, and it seems the lesson has stuck. She was just as good and willing to come along with me as long as there was food involved. Next step is to introduce the rest of the flock to the halter. I seriously doubt it will go quite as smoothly as it did will Ms. Pepper. Fun times ahead. The baby bunnies have arrived!